Jailbreak veterans would know about a handy tweak called PwnTunes, which eliminates the need of using iTunes when managing music library on an iOS device. If you have been a user of this tweak on previous versions of the operating system, then you would be pleased to know that PwnTunes for iOS 9 has been released. This means your iOS 9 powered iPhone, iPad or iPod touch can run PwnTunes, allowing you to simply drag and drop music to your device without iTunes. A big benefit of using PwnTunes tweaks for iOS 9 is that it allows users to add songs to an iOS device from multiple computers. So if you are at your friends house, and like his or her music collection, you can simply drag and drop the songs you like to your device using a USB cable. This behavior is obviously better than the default one, as iOS only lets you sync with a single machine. You will also be able to access songs that are on your iOS device from any computer, and copy/paste them to the new machine. This also includes copies of songs you have purchased from the iTunes store. While the main purpose of PwnTunes tweak is to give you easy access to music library without iTunes, it also turns your iPhone or iPad into a USB storage device, meaning you can store any type of files on them. This is great for those who have devices of large memory capacity such as 64GB or 128GB models. There is no client app required on the computer, so in order to use PwnTunes all you need is the tweak installed on your iOS device and a USB lightning cable. 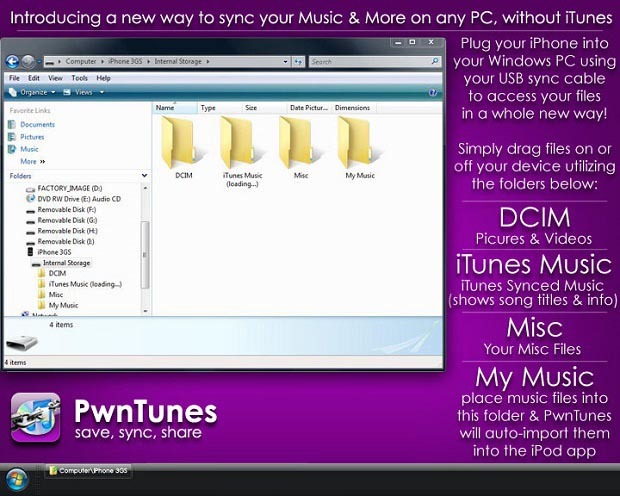 PwnTunes tweak is available in Cydia for $12.99.